Blinds and verticals are typically made from vinyl or wood with rigid, rectangular panels that allow as much light into your home as you’d like. They work similarly to standard, PVC blinds but have solid frames and typically do a better job of sealing out daylight when closed all the way. Our showrooms feature a varied selection of blinds and verticals made by industry-leading brands from materials like real wood, fauxwood, PVC, and cloth. 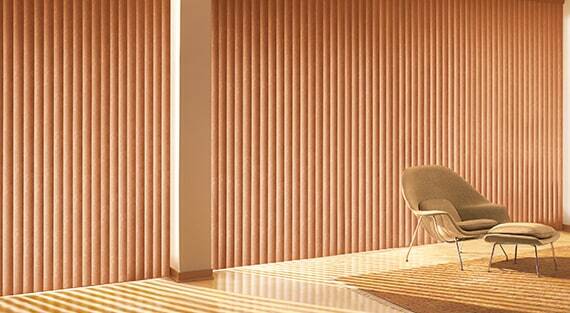 Blinds and verticals are available made from numerous material types ranging from bamboo and balsa to vinyl and plastic. Depending on the time of day and what you’re doing, you can adjust your blinds and verticals to allow the exact amount of light you’d like. If you’re watching TV during the day, you might want to block out any light that’s causing glare on your screen but if you’ve just woken up to a beautiful summer day, then you might want to open them up and appreciate the natural light with your breakfast and coffee. The most common and traditional choice, PVC blinds are the narrow plastic blinds that hang horizontally on cords and can have their tilt adjusted with a wand on the side to allow more or less light. PVC blinds are actually available in an array of sizes but the ones you see most are the standard, 1-inch blinds. SmartPrivacy® Faux Wood Blinds featuring Performance Cordless are "Best for Kids" certified and comply with the latest ANSI/WCMA standards. SmartPrivacy® Faux Wood Blinds featuring Performance Cordless are certified safe for extra peace of mind.